On January 21, 2014, the sky was clear again. Therefore, I decided to take my telescope out once more. Outside was a temperature of -18 oC. It was not that windy. 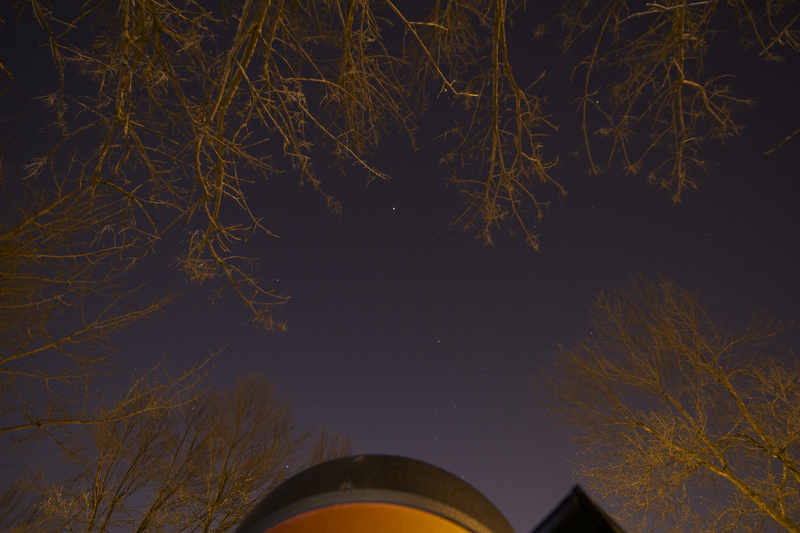 I set up on my driveway, which had a great view of the constellation Orion. 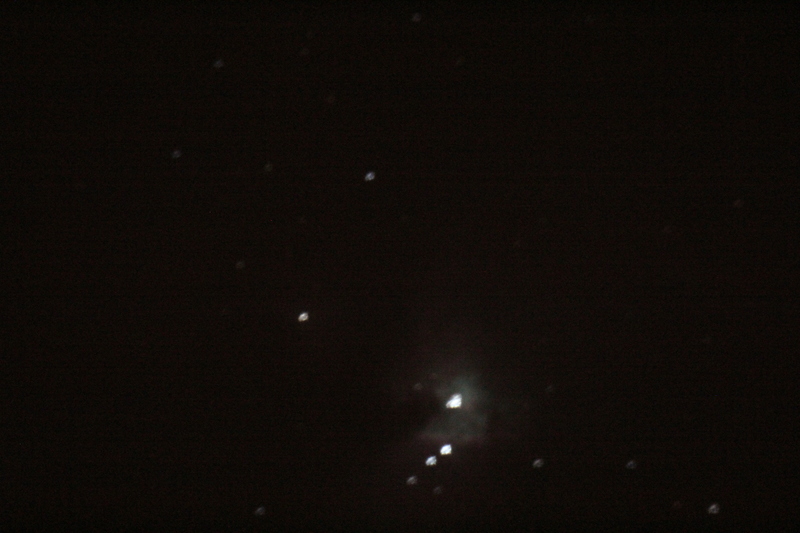 My goal for this session was to find the Orion Nebula once more and properly image it. When everything is set up, I align my telescope to two stars: Betelgeuse, and Mirfak. It was a successful alignment. After alignment, I slewed to M42. I looked at it through my eyepiece, and I saw the glorius green cloud of the Orion Nebula, also known as M42. 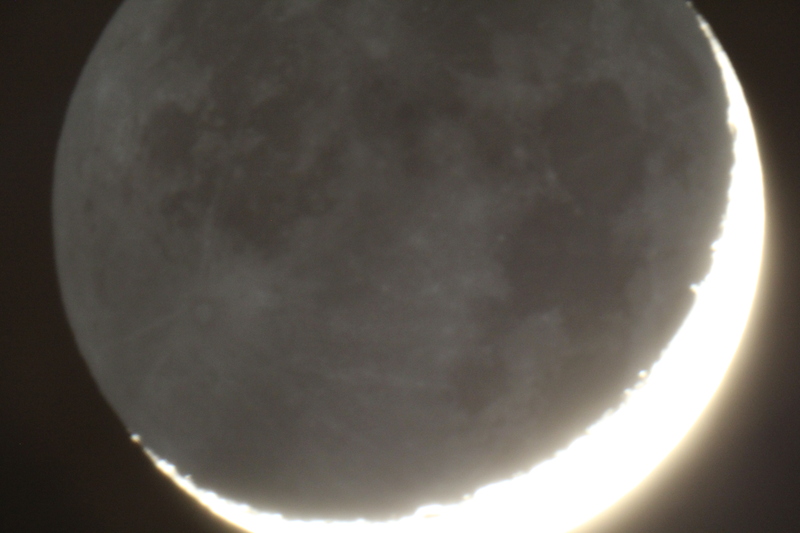 Since I already tried taking an image with the DSLR, I tried to image it using the CCD Camera. For those who don’t know, A CCD Camera is a camera that uses a chip to collect the light and create an image from it. CCD stands for Charged-Coupled Device. It is a major advancement in digital imaging technology. It is used not only for light detection, but when high-quality images are needed. 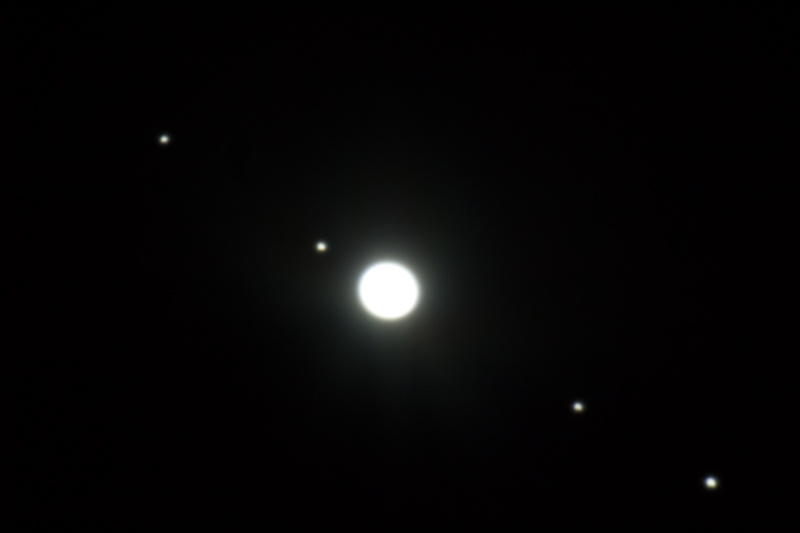 The first images I took, such as my triple-transit Jupiter image, or my Saturn image, were with a CCD camera.  After fiddling with the telescope, eye piece and CCD camera, I was able to find an image of three stars. I don’t know if that was M42, however, I was happy to be able to image far away stars from my CCD camera, designed for planetary imaging. Unfortunately, after processing the video footage, I realized it was not M42, but were three stars that were poorly focused. After filming the stars for a few minutes, I decided to stop CCD imaging the stars. I was determined to find M42 though. 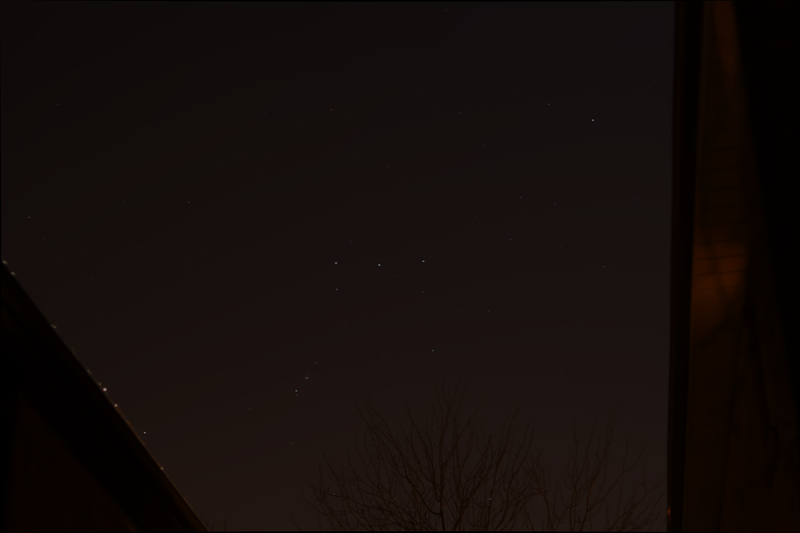 During my imaging attempts of M42, I went to the side of my house, and I saw the Big Dipper, clear as night, between my house and my neighbour’s house. Seeing it at its position inspired me to image it, but at a later time, after Jupiter. After imaging M42, I set my sight to CCD image Jupiter. However, before I could do that, I see my computer has restarted and repairing itself. Waiting for it, I realize that the computer is on a cycle that prevents the operating system from booting. I don’t know why, but I believe it was because of the intense cold prevented the proper functioning of my computer. Therefore, I decided to take my computer inside to warm up. With my computer out of order, I decided to focus my attention on capturing that image of the Big Dipper. I relocated my set up to the dark area between my house and my neighbour’s. I set the camera on top of my piggyback mount. I then set the telescope to capture many long exposure images of the sky. They turned out beautifully. Note that on the center-bottom portion of the images, my telescope was visible. After I was satisfied in the quality and number of images taken, I decided to refocus my attention on Jupiter. I went back inside to obtain my laptop. At the same time I also went to swap out the batteries. To conserve used batteries, I reused a set of old batteries having warmed up to room temperature, thus allowing any extra charge to be used up. I went outside and replaced the batteries. I set it up and I set the telescope to realign itself to Jupiter. However, the telescope was starting to give me a No Response 17 code. That means that my hand controller lost contact with the Altitude motor, which means I had no up or down capabilities. I conjectured it to being exposed to the cold for so long. However, I also read that it could be due to the used batteries having been completely drained. Regardless of why, I decided to call it a night. I brought all my equipment back in, and got warm. That night was not only quite successful, but has been the busiest I had ever been. I ran back into my house to get equipment more times than any other time. 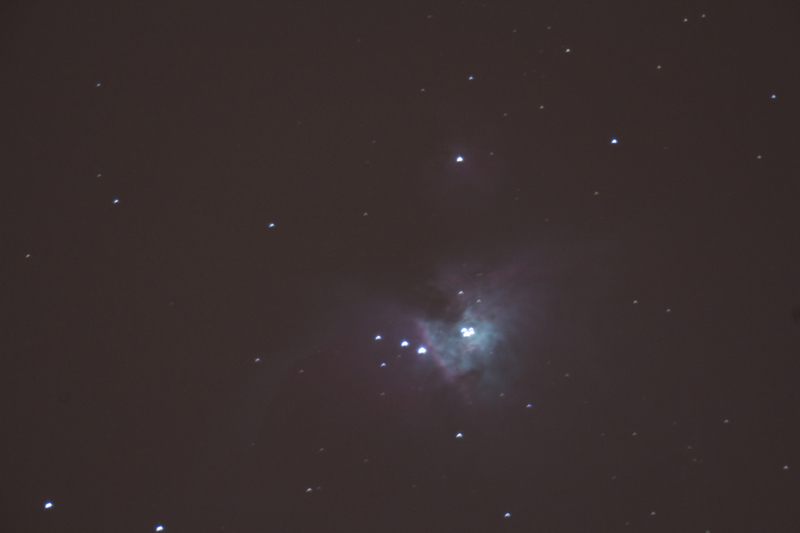 I got a better image of M42 despite it not being at the quality I desire it to be. I was able to image a farway star using CCD. 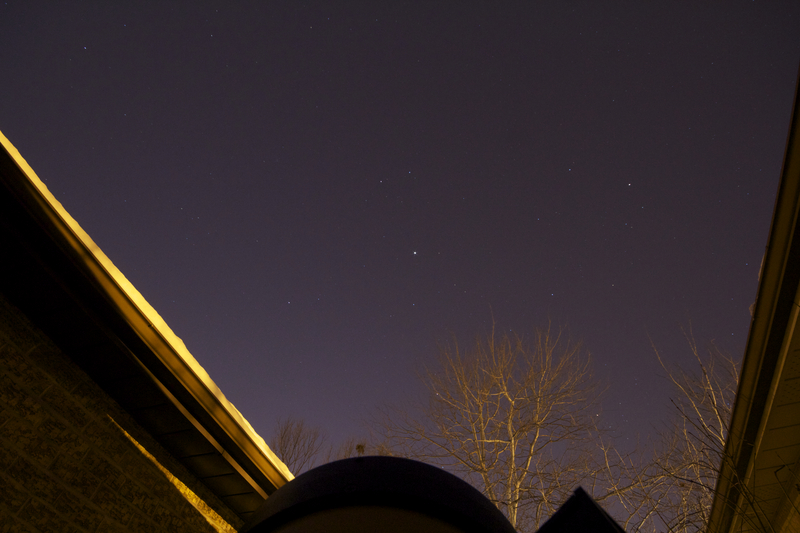 I was also able to get a lot of long-exposure images of the big dipper and the night sky. Unfortunately, I wasn’t able to image Jupiter. The next time I observe, I will image Jupiter. I also discovered focusing issues when I use my DSLR camera. It will have to be resolved if I want to get better images. It has been a great learning experience, and I hope to do it again. Thank You for following my blog. I hope you enjoy it. Happy Observing! On January 20, 2014, the sky cleared again just in time for the bitter cold (-20 degrees Celsius). Determined to observe the night sky, taking what I learned from my last observation into account, I decided to point my telescope at the moon. For those who don’t know, mares, which translate to seas, are the dark, flat areas on the Moon. They were formed from ancient volcanic eruptions. The mares are much younger than the surrounding areas because they have fewer craters than their surroundings. This suggests that they have formed relatively recently. Interestingly, the majority of the mares on the moon are on the near side of the moon, visible from Earth. Scientists still debate why that is the case. The Observer’s Certificate requires me to find six mares for the certificate. In addition, I need to find six Craters. Surrounding the Mare are the highlands, which are the lighter features on the Moon that are riddled with craters. Craters are circular formations of varying depth, size, and albedo on the moon. They were formed as a result of collisions with asteroids. Depending on the size, those asteroids could leave a large crater over many km long in diameter like Crater Ptolemaeus at 153 km, or it can leave a small dent like Crater Grace at 1 km. Craters are best viewed at the terminator line, where the mixture of darkness and light give it a very interesting appearance. The image below is the Lunar surface up close with Mares and Craters visible. The top-right of Image shows a Mare. Note the many craters in the image. Looking at the moon, I saw a lot of flat surfaces, and craters, and white areas. At the beginning, I didn’t know where to start. It felt (actually, it was) like looking at another world. I soon decided to start my search at the terminator line. I saw a mare there, but I couldn’t identify it. I also saw a crater right at the terminator line. Eventually, I saw an intense, white crater in the western portion of the moon. Luckily I found a map to refer to, which led me to discover that it is the Crater Copernicus. That discovery gave me a reference point to search for the other features. Looking at the map, I conjectured that the mare near the terminator line was Mare Crisium. It was very circular, and it connected to the mare beside it. However, I wasn’t certain. I decided to hold off on checking it off my list. Looking around, I found, to the west of Copernicus, a large mare that covered a large portion of the moon. I found that to be the Oceanus Procellarum. I checked it off my list. Soon enough, I decided to return to the unknown mare at the terminator line. I still couldn’t figure out what mare it is. I looked at the same mare on the map, but both images didn’t add up. I suspected that it wasn’t Mare Crisium after all. However, something caught my eye. It was the crater at the terminator line. After looking at my telescope and at the map again, I confirmed that what I saw was Crater Posidonus. This was significant not only because I checked off another object off my list, but I found the terminator line on the map. From that I realized that Mare Crisium is in the shadowed part of the moon, and that the Mare adjacent to Crater Poseidonus was Mare Serenitatis. It propelled me forward in my mission becauase I was able to know, on the map what to look for and what not to look for. I soon continued on my mission. Soon enough, I found Mare Imbrium located beside Mare Serenitatis. I also realized that another mare near the terminator line was actually Sinus Medii, which was not on my list. Moving forward, I struggled to find more objects for a while. However, I realized that the orientation of the image of the moon on my telescope was confusing me. It prevented me from finding the right lunar features. Therefore, I decided to look at the image a different way. As a result, I was able to find Mare Frigoris, Mare Vaproum, and Mare Nubium. I was also able to find Mare Cognitum before Mare Nubium, but it was not on my list. 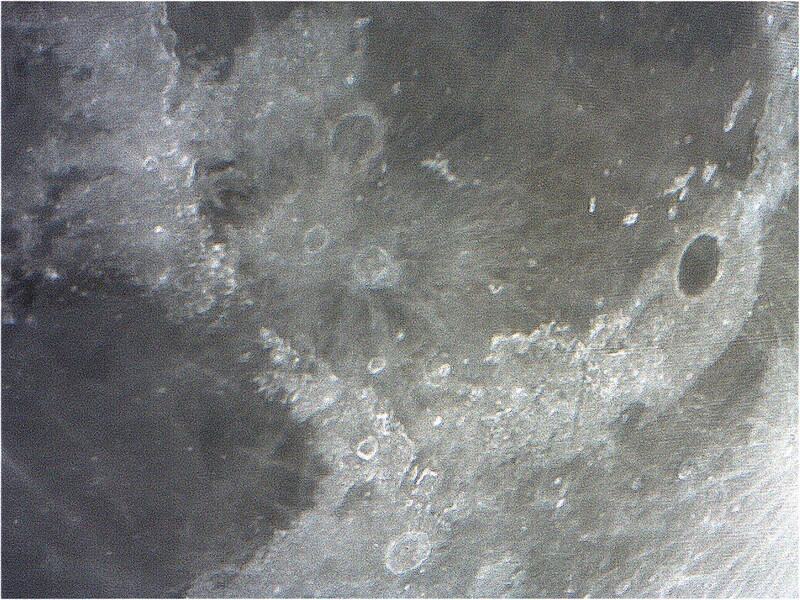 In between finding those Mares, I was able to find, Crater Grimaldi at the very edge of the moon; Crater Ptolemaeus, which is close to Mare Nubium and Sinus Medii; Crater Plato, near Mare Frigoris, and Mare Imbrium; and after a lot of searching, I finally found Crater Gassendi. It took me two hours to find those twelve objects. I even had to change the batteries of my telescope before I found Crater Gassendi. However, it was worth it. After that, I decided to call it a night and bring everything back inside to warm up after a cold night. It was a productive night, which gave me valuable knowledge of the Moon. I hope to keep doing that in the future when the moon is more illuminated. For those who have any questions about astronomy, I will be setting up a facebook page where you can ask those questions. There are no stupid questions here. If you have a question, I will do my best to answer it. In addition to my posts, I will regularly post a blog entry talking about a specific topic, such as Formation of Planets, Why the rings of Saturn have gaps, or how stars are born. In addition to my regular posts, I will post every month an update on astronomical events for the month. Thank you for following me and I hope you continue to enjoy what you read here. Coursera Class – Introduction to Astronomy. January 4th was a busy day for me. I woke up at 8 pm, got ready and went to the Ontario Science Centre (OSC) at 9:30 am. I went to the OSC because the Royal Astronomical Society of Canada (RASC) was hosting an event there. 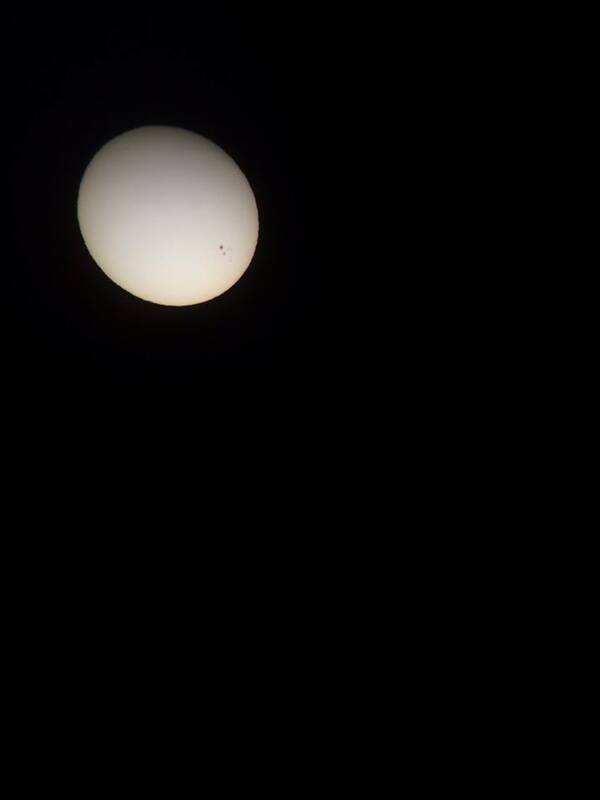 It was a solar observation event. I went to the event to gain experience in the field of Solar Observation. I arrived there at 10 am. There, I saw a two astronomers with three telescopes set up. One telescope had a Hydrogen-Alpha filter, which blocks out most of the light, leaving only the red emission spectrum line visible. Another telescope used a regular eyepiece that used a white light filter. A third telescope did not have an eyepiece, but it projected the image of the sun onto a piece of cardboard for public viewing of the sun without putting your eye in an eyepiece. In addition, we had two solar observation glasses. The first one used the white-light filter, and the other one, which I brought from home, used black polymer which made the sun appear orange-yellow rather than white. A total of three astronomers from RASC were there. From 10 – 12 pm, we braved the cold of winter to show the public the sun and to get them curious about astronomy. We had many visitors, including a few members of RASC. The Sun as viewed from the white-light telescope. Overall, we had a successful event. Many people braved the cold for just a few extra minutes to witness the majesty of the sun. This event gave me experience in the field of Solar observation, which I can take home and apply it in my astronomical sessions in the future. I hope to do so soon. In my previous blog post, I had my heart set on going back out in the bitter -16 C cold to image the Orion Nebula, and I did just that. 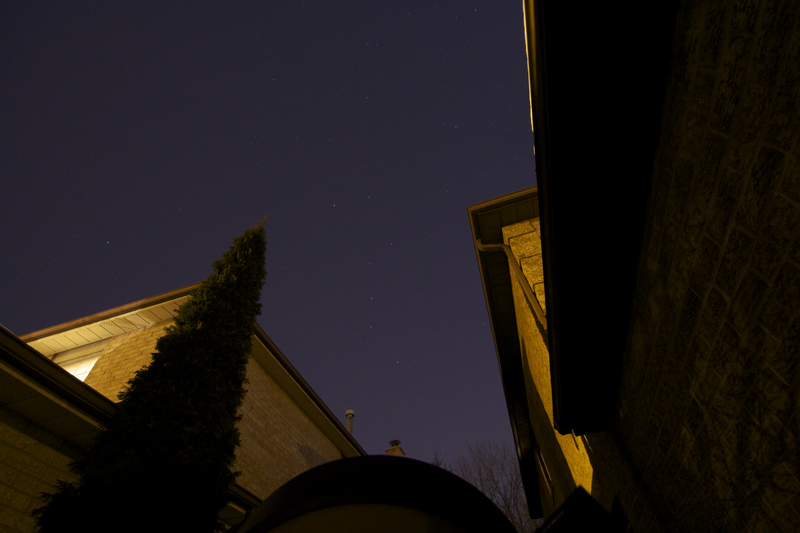 I took my telescope to the backyard, where I could get a good view of the constellation Orion. After aligning my telescope to Jupiter, I slewed to the stars that represent Orion’s sword. Looking for the green cloud, I saw all of Orion’s stars again in its unique locations and patterns. It was quite a sight to see. Eventually I was able to find the faint green cloud I found in a previous astronomy session, and I took a series of long exposure photographs of the Orion Nebula with an ISO of 1600. Unfortunately, It wasn’t properly focused, and I had trouble focusing my telescope. I was only able to get one “good” photo of the Orion Nebula. It’s not that focused, but I did my best. The Orion Nebula. Forgive me, the image is blurry. After taking a few more long exposure images that were not successful, I decided to call it a night, and go back inside. I brought the eyepiece and camera indoors first, and then the telescope, making sure to use gloves instead of my bare hands. Once indoors, I put all telescopic equipment in its right place, and then warmed up by the fire again. These two sessions were quite productive. I got my first taste of DSLR astrophotography by taking a two second exposure image of the moon capturing the Old Moon in the New Moon’s Cradle phenomenon. I was able to see Jupiter at close to opposition, despite my failure to image it, and I got my first image of the Orion Nebula. While it is clear I need to work on my astrophotographic skills, I have taken my first steps into it. Tomorrow will be an early day, for there is another session in the morning. Stay Tuned. Happy New Year to everyone and Merry Armenian Christmas (January 6th) to all my Armenian friends. On January 3rd, as the sun set, I noticed in the navy blue sky, that a thin crescent moon was visible in the sky. Therefore, I decided to take my telescope out and take images of the moon. For Christmas, I got nice additions to my telescope: a new T-Ring and T-adapter for use with DSLR cameras. Therefore, I decided to take the photos using my brother’s DSLR camera, which was a Canon EOS D60. 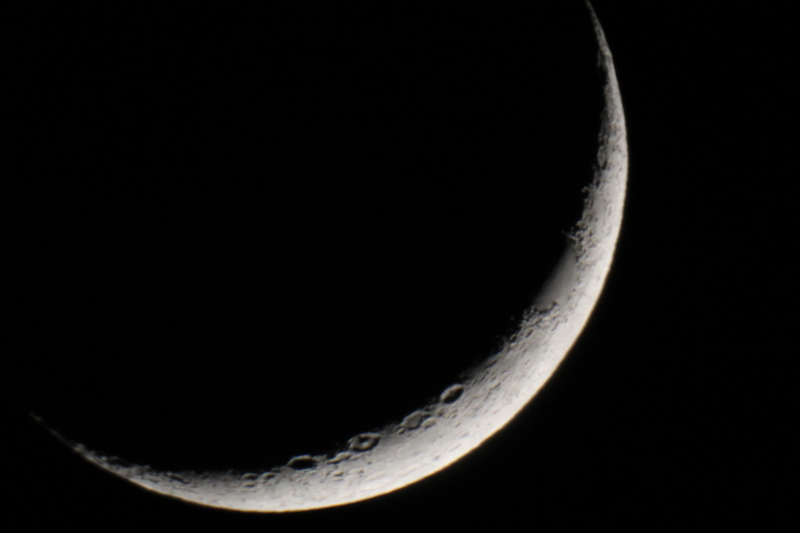 I took my telescope out in the bitter cold night at -16 degrees celsus, and quickly got it set up aligning it to the crescent moon. Looking at the crescent moon, I saw a small portion of a mare, and many craters on the lower part of the crescent. It was beautiful. 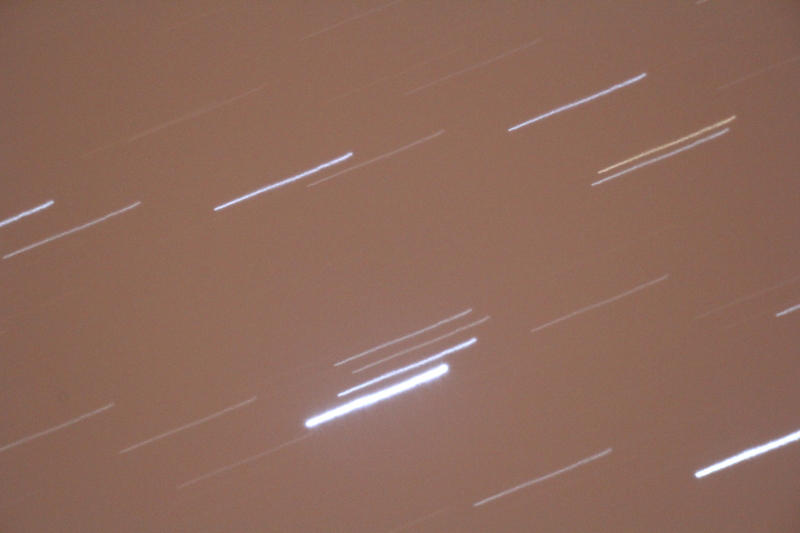 Since I was using a DSLR camera, I could take long exposure images, which I could not do using my CCD imager. With that feature, I have the ability to obtain different kinds of pictures of the different bodies of the solar system. I quickly went about taking the photo. I experimented with the exposure setting, and tried to figure out how to eliminate the wobble that I created by pressing the shutter button. Eventually, I found the right setting for the image and captured a fair number of images of the moon. The moon captured in my images were two second exposure photos with the other settings set to auto. It showed the lit portion of the moon completely white due to the collection of light from the moon, and the dark portion dimly lit. The reason that happened is because the Earth also reflects the sunlight that it receives from the Sun. The reflected sunlight travels to all different directions, and a certain amount of the sunlight hits the moon. This phenomenon is called Planetshine, and it creates this photographic phenomenon called, “The Old Moon in the New Moon’s Cradle.” It is a unique sight for those who know how to find and capture it. Below is a comparison of the crescent moon and the Old Moon in the New Moon’s Cradle. After the Moon set below a row of houses, out of my sight, I decided to focus my attention on Jupiter. It would be reaching opposition the next day, which means it would begin moving backwards relative to the Celestial Sphere, it orbits closest to the Earth, which makes it seem closer than it actually is, and it is visible all night, much like a Full Moon. Since the next day was predicted to be cloudy, I decided to look at it now. 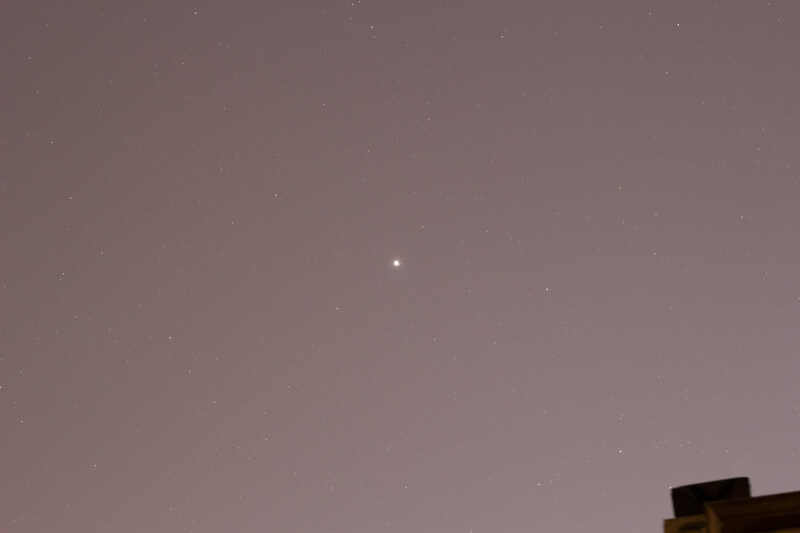 Looking at Jupiter through the DSLR camera was a different (no, difficult!) experience than through the eye piece. Jupiter looked quite over-exposed. Any attempt to take a long exposure image of Jupiter failed as the camera wobbled too much and my telescope tracking feature was not doing a good job at keeping the image still. I didn’t have enough technique to take a good image at that time. As a result, I decided to pack it in for the night. I took all my equipment inside and got warm by the fire. It would usually be over for the night, but the sky was still clear, and I felt the need to take my telescope out once more. Therefore, I did just that. Stay tuned for the rest of this blog post.